The Bugatti Chiron was never a car you were supposed to track. It was meant for impressing fellow yachters and high-speed, straight-line runs. 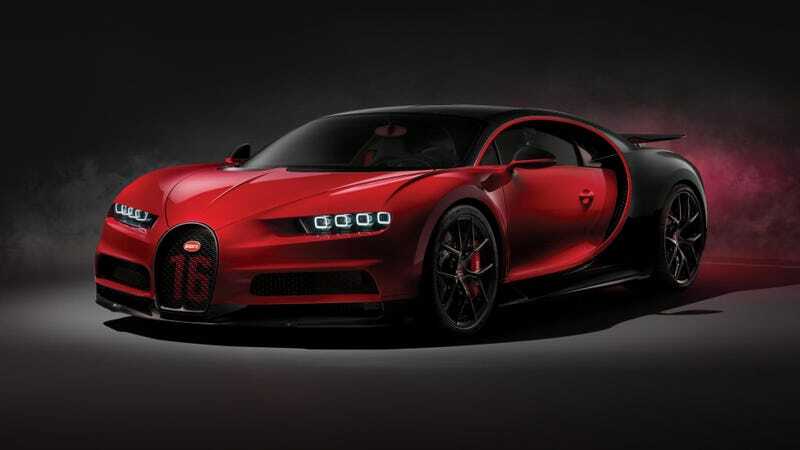 Bugatti wants to change that with the new Chiron Sport. Not by adding more power, mind you. The Chiron, with 1,500 horsepower from its 8.0-liter quad-turbocharged W16 engine, probably doesn’t need more power. Instead, what Bugatti has done is improved the car’s handling by dropping the weight and stiffening up the suspension a bit. The shocks are now 10 percent stiffer and the Chiron Sport has a dynamic torque vectoring system that distributes torque individually to each side. Thanks to lighter wheels, a carbon fiber intercooler cover and carbon fiber windshield wiper arms (! ), it has dropped about 40 pounds (18 kg). Which doesn’t really seem like a lot? This new development means that Bugatti no longer needs the articulated joints which normally feature on conventional wipers. The function of these joints has been integrated into the carbon fibre structure of the wiper arms. In addition, the wiper arm tips, which are made from aluminium, are produced by a weight-saving 3-D printing process. This means that the new carbon fibre wipers are 77 percent or 1.4 kg lighter than their predecessors. Apparently, that little bit of weight reduction and the improved handling and suspension did make a difference, because Bugatti reports that the Chiron Sport achieved a lap around the Nardò circuit five seconds faster than the base Chiron. Visually, the Chiron Sport wears different wheels than the standard Chiron and has four exhaust tips, rather than the rectangular ones on the regular model. It also has “Sport” and “Chiron Sport” written on a few places, so no one can confuse your special Chiron for a run-of-the-mill one. The cost, you ask? Haha. The Chiron Sport currently on display at Geneva costs €2.98 million (about $3.7 million). Better start saving.